On the left, a representative structure for localization of heat; the cross section of structure and temperature distribution. On the right, a picture of enhanced steam generation by the DLS structure under solar illumination. The structure—a layer of graphite flakes and an underlying carbon foam—is a porous, insulating material structure that floats on water. When sunlight hits the structure's surface, it creates a hotspot in the graphite, drawing water up through the material's pores, where it evaporates as steam. The brighter the light, the more steam is generated. The new material is able to convert 85 percent of incoming solar energy into steam—a significant improvement over recent approaches to solar-powered steam generation. What's more, the setup loses very little heat in the process, and can produce steam at relatively low solar intensity. This would mean that, if scaled up, the setup would likely not require complex, costly systems to highly concentrate sunlight. Hadi Ghasemi, a postdoc in MIT's Department of Mechanical Engineering, says the spongelike structure can be made from relatively inexpensive materials—a particular advantage for a variety of compact, steam-powered applications. "Steam is important for desalination, hygiene systems, and sterilization," says Ghasemi, who led the development of the structure. "Especially in remote areas where the sun is the only source of energy, if you can generate steam with solar energy, it would be very useful." Recently, scientists have explored ways to improve the efficiency of solar-thermal harvesting by developing new solar receivers and by working with nanofluids. 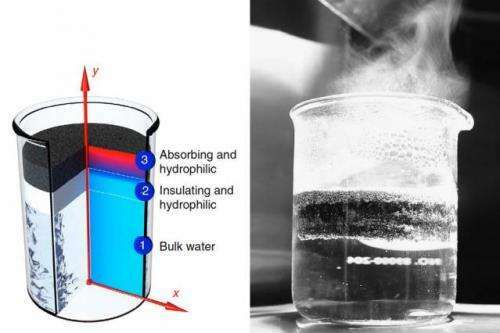 The latter approach involves mixing water with nanoparticles that heat up quickly when exposed to sunlight, vaporizing the surrounding water molecules as steam. But initiating this reaction requires very intense solar energy—about 1,000 times that of an average sunny day. By contrast, the MIT approach generates steam at a solar intensity about 10 times that of a sunny day—the lowest optical concentration reported thus far. The implication, the researchers say, is that steam-generating applications can function with lower sunlight concentration and less-expensive tracking systems. "This is a huge advantage in cost-reduction," Ghasemi says. "That's exciting for us because we've come up with a new approach to solar steam generation." The approach itself is relatively simple: Since steam is generated at the surface of a liquid, Ghasemi looked for a material that could both efficiently absorb sunlight and generate steam at a liquid's surface. After trials with multiple materials, he settled on a thin, double-layered, disc-shaped structure. Its top layer is made from graphite that the researchers exfoliated by placing the material in a microwave. The effect, Chen says, is "just like popcorn": The graphite bubbles up, forming a nest of flakes. The result is a highly porous material that can better absorb and retain solar energy. The structure's bottom layer is a carbon foam that contains pockets of air to keep the foam afloat and act as an insulator, preventing heat from escaping to the underlying liquid. The foam also contains very small pores that allow water to creep up through the structure via capillary action. The researchers tested the structure by placing it in a chamber of water and exposing it to a solar simulator—a light source that simulates various intensities of solar radiation. They found they were able to convert 85 percent of solar energy into steam at a solar intensity 10 times that of a typical sunny day. "There can be different combinations of materials that can be used in these two layers that can lead to higher efficiencies at lower concentrations," Ghasemi says. "There is still a lot of research that can be done on implementing this in larger systems." "a solar intensity about 10 times that of a sunny day" implies that the setup will still "require complex, costly systems to highly concentrate sunlight", regardless of scale-up benefits. Consider a portable system, which is much sought after for developing countries: A 10" x 10" (100 sq in) fresnel can easily focus sunlight down to a 3.2" X 3.2" (10 in sq) spot, which is a 10X increase in the solar flux impinging upon the absorber disk. It would take a 100" x 100" lens focused to the same 10 square inches to do the same thing using the older absorber technology. The 10" lens and a frame to hold it and the water boiler is something you could pack in backpack. Not so with a 100" lens. For the applications mentioned- remote steam generation for distillation and sterilization- this is a huge improvement over previous designs. What happens to all the dissolved minerals and other impurities left behind after the phase change? It would seem this material would become quickly clogged with salt, calcium etc. after a short while unless highly pure or distilled water is used. Can the material produce steam under pressure? A small system may be OK for individual use, but you would need to provide one for each user. Did you read the part about "There is still a lot of research that can be done on implementing this in larger systems"?